The Jacob Burns Law Library recently acquired the collection of Christopher Egolf, Law School class of 1975, who was an avid collector of patents and patent practice materials. Mr. Egolf died in 2016, and his son, Peter, generously donated his collection to the Law Library in 2017. After earning B.S. and M.S. degrees in chemical engineering from MIT, Mr. Egolf worked as a chemical engineer for three years. He then enrolled at GW Law and, during his career as a patent attorney after graduating, worked both in-house and in private practice. Mr. Egolf also owned his own consulting firm, which he ran from 2005 until 2016, when he retired. 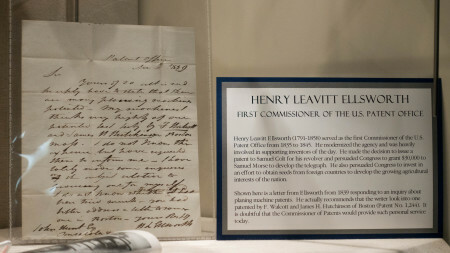 His collection comprises thousands of patent-related items, including American and foreign patents, books about patents and patent laws, correspondence, postcards, patent models, brochures and pamphlets issued by patent attorneys and agents, and stereoscopic photographs of the United States Patent Office (which now houses the National Museum of American Art and the National Portrait Gallery). It offers fascinating insights into the development of the American patent system and the practice of patent law, particularly during the nineteenth century, and their contributions to industrial America. 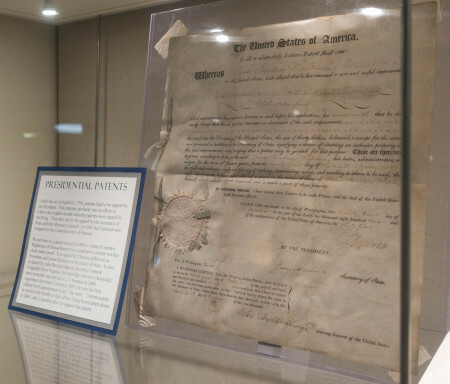 Included among the more than 150 patents in the Egolf Patent Collection are two signed by President Thomas Jefferson (in 1805 & 1806) and ones signed by Presidents John Quincy Adams (in 1827) and Andrew Jackson (in 1836). (Patents such as these are often called “Presidential Patents” on account of their notable signatures, although Abraham Lincoln is the only U.S. president to have been granted a U.S. patent, Patent No. 6469, for a device to lift boats stuck on sandbars.) Pursuant to the Patent Act of 1790, which created the United States Patent Office, patents had to be signed by the President, the Secretary of State, and the Attorney General. In 1836 this function was assigned to the Commissioner of Patents. The collection contains ten boxes of books about patents and patent laws. Titles range from George Ticknor Curtis’s A Treatise on the Law of Patents for Useful Inventions, as Enacted and Administered in the United States of America (1873) to Christopher B. Cooper’s Patently Absurd: The Most Ridiculous Devices Ever Invented (2004). The Law Library has cataloged the books that it had not owned and has made them discoverable through its catalog, JACOB: http://law.gwu.libguides.com/researchportal. 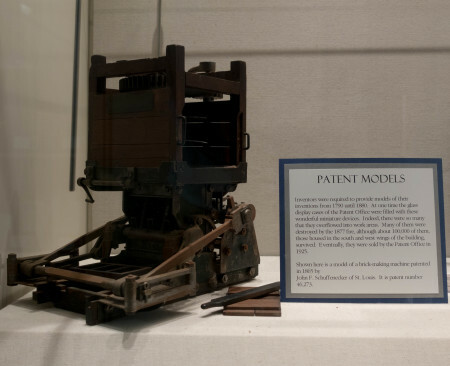 The Law Library currently has on display an exhibit of some of the items in the collection, including a patent granted in 1806 that is signed by Thomas Jefferson as President and James Madison as Secretary of State (to James P. Wightman of Massachusetts for a mixture to render woolen cloth waterproof), a model of a brick-making machine patented in 1865, and a letter written in 1839 by Henry Leavitt Ellsworth, who was serving as the first Commissioner of Patents, responding to an inquiry about planing machine patents. The Law Library is most grateful to Peter Egolf for his generosity in donating his father’s patent-related collection to GW Law.